Most teenagers on Facebook are so into increasing their Facebook Likes. Some think that it’s all about just posting beautiful photos or videos of themselves which may be very hard if you’re not a celebrity or an entertainer. Now you may ask the question “How Can I Increase My Facebook Likes?” This is the reason am here for you. Facebook has developed some tools to help users do this organically. I also know you’ve heard of people buying likes. This is not organic and I don’t advise you do it. Anytime you are trying to build an online presence, go for organic strategies. They are safer and leave you with a clean online footprint. This gives you a greater advantage when it comes to increasing your likes most especially if you have a page on Facebook where you post your blog contents. People are easily engaged in what they are familiar with even if it’s a little. Once you post a viral content people are already hearing about, they get attracted to it and this can earn you lots of likes. If you go through my review categories, you are going to come across some detailed contents on Facebook Ads. I write on them because of how advantageous they are. Facebook Ads make it easier for you and your contents to trend on Facebook. It exposes what you post on FB to a large and diverse set of audience. FB Ads will give you thousands and even millions of likes on Facebook. I also created content on how to start and grow your Facebook Fan Page. Fans are audiences which are interested in you and what you publish. Having a Facebook Fan Page can do this for you with ease. On your Fan Page, you have an option to invite people to like your page and contents. 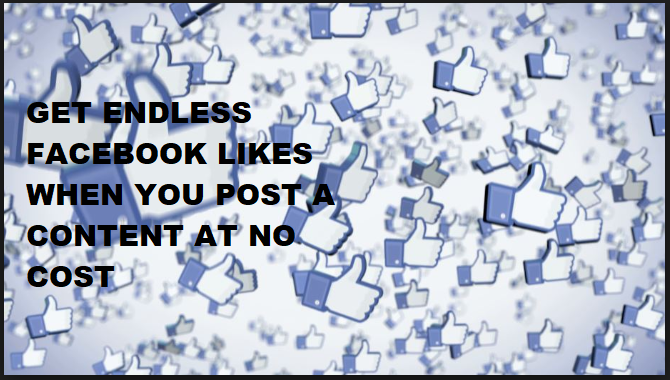 Using this, you can legally ask for likes without it seeming like you are begging for it. People are always attracted to things they can benefit from. The gifts must not be tangible. The internet has made things like this even easier. You can offer coupons to people for liking your page or content. Also for instance, if you post something like an eBook you want people to like, share, read, you can give it out for free to a particular number of persons who hits that like button first. Common on, how do you expect to be well known and like if you don’t engage with people. Your voice and opinions need to be heard for people to recognize you. Try to have answers to things people discuss and contribute you opinions. From this you can get friend requests from these people and invite them to like your page. Being rude or harsh to people can drive a lot of person from you. Once people don’t like you in your communities, then they can’t like you page or your content. So be very careful how you relate with people of Facebook. Respect is reciprocal so don’t joke with it. This makes liking your content on Facebook easier because it helps people see the number of persons on Facebook who have liked you page. It will push visitors to like it too on Facebook. Hope you find this content helpful. Don’t forget to share this with your friends who are desperately in need of Facebook Traffic.